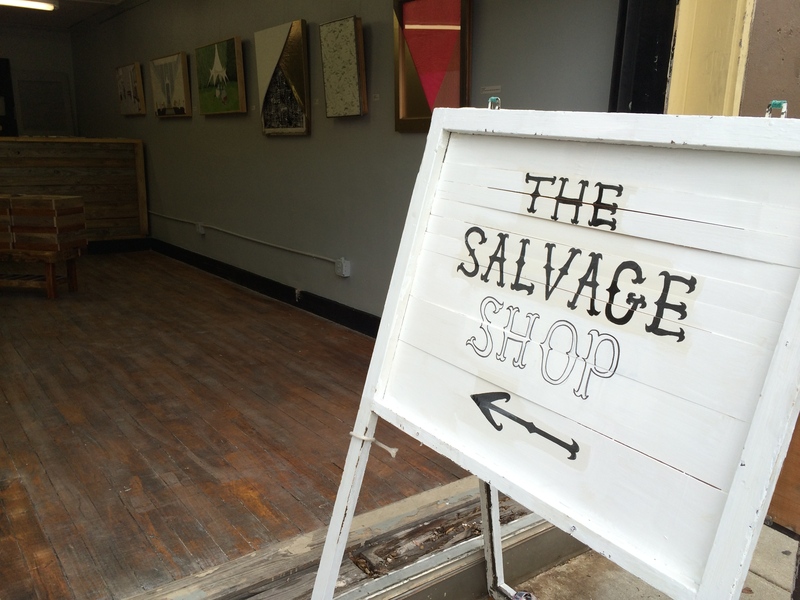 Relocated and renewed: The Salvage Shop of Knox Heritage | Oh, the Places We See . . .
Great turnout! 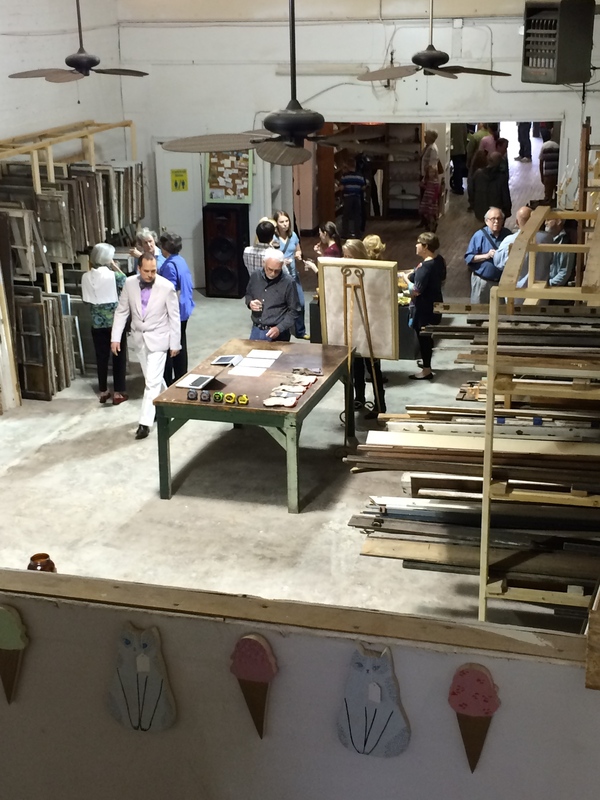 Opening of The Art and Salvage Shop of Knox Heritage. First Friday in Knoxville (especially during Dogwood Arts Festival) brings on new openings and new opportunities to view art and reconnect with community. But picking one or two events becomes a challenge in and of itself. 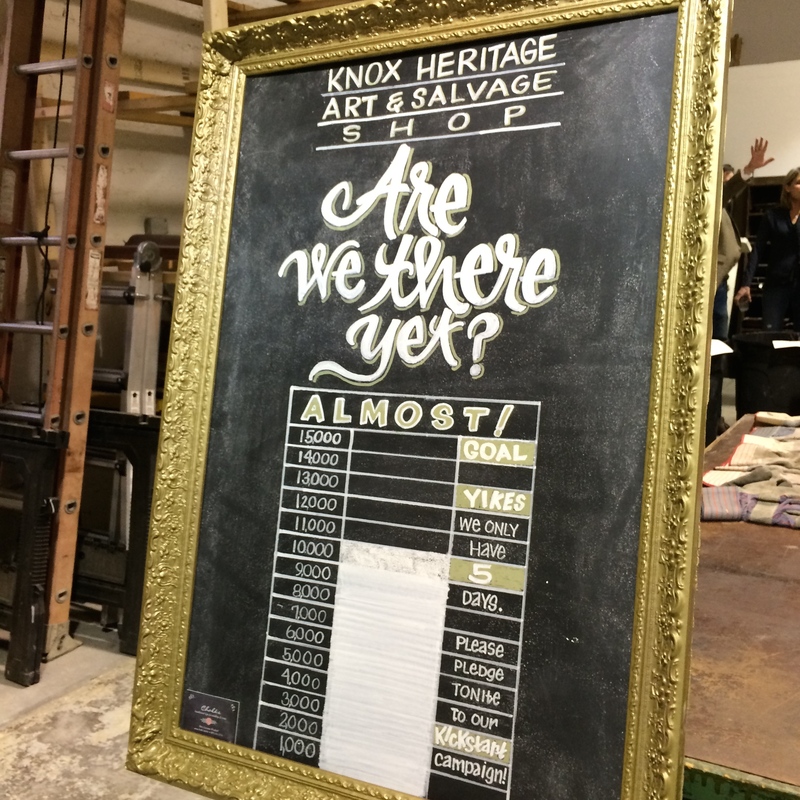 The opening of the newly relocated Art and Salvage Shop of Knox Heritage hit home with us: we love art, old things, and the mission of Knox Heritage. So we found ourselves at the new location — 619 Broadway — at the Grand Opening. And so did a lot of other folks! Open spaces with bare concrete floors and exposed brick seemed a fitting backdrop for the goods inside. 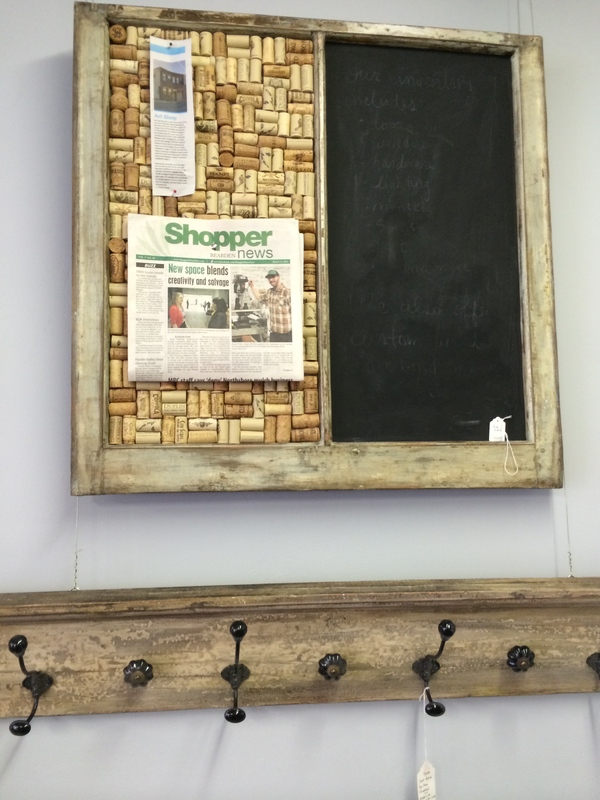 Repurposed salvage like this chalkboard with corks and the coat rack from molding caught our eyes. Along with bins of salvaged windows and doors . . .
And walls of objets d’art! 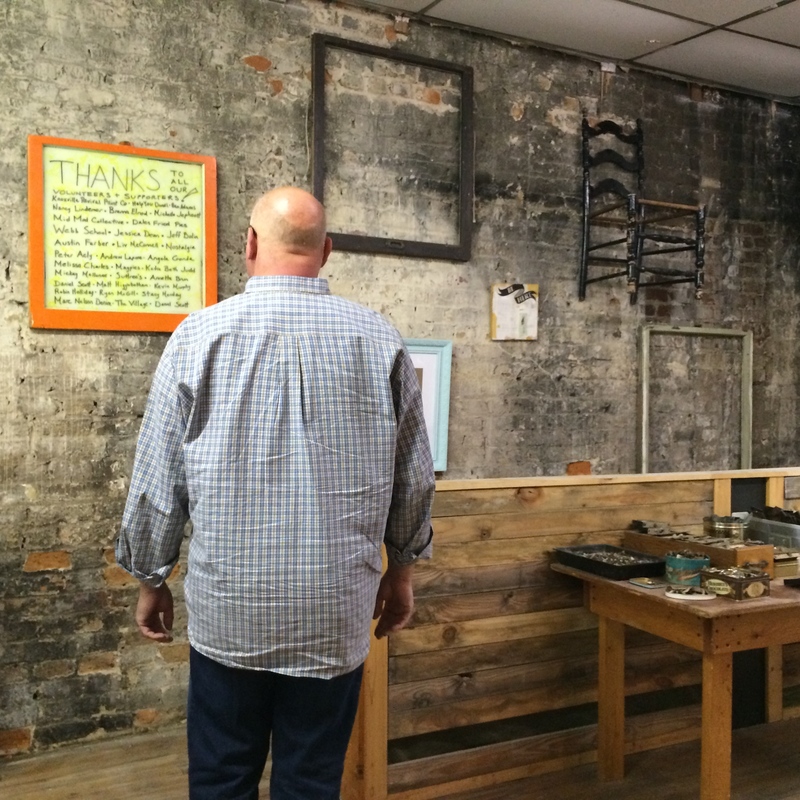 We found this guest reading the THANKS poster — it lists hard-working volunteers and staff responsible for re-opening the old building (once home to a bicycle repair shop) as a salvage shop. To celebrate the Grand Opening, staff, volunteers, and guests gathered for conversation and finger foods in the main room. 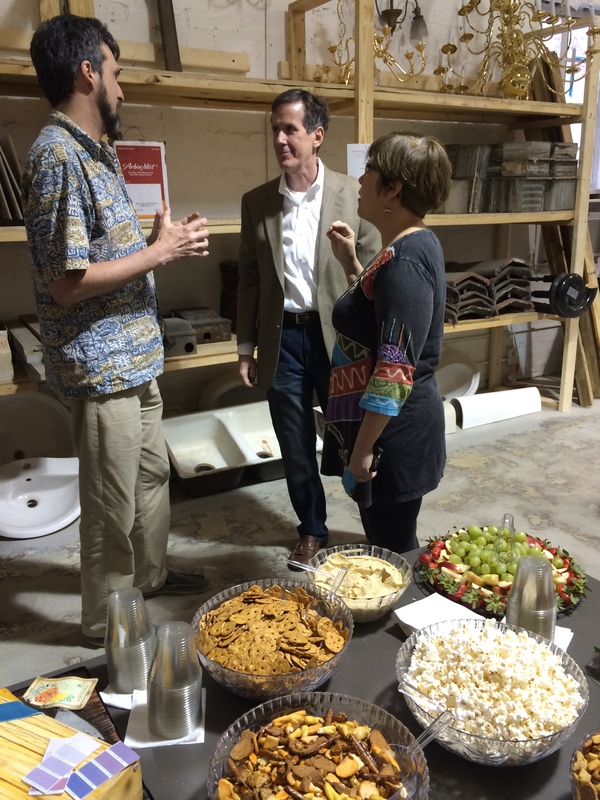 Talking about the opening of the newly relocated Salvage Shop: Brent Menchey, John Craig, and Kim Trent, Director of Knox Heritage. A cake from Magpies became the focus of conversation around the snack table. Yes, it’s a cake. And everything was edible right down to the trowels, seed labels, paint chips. Even the dirt. 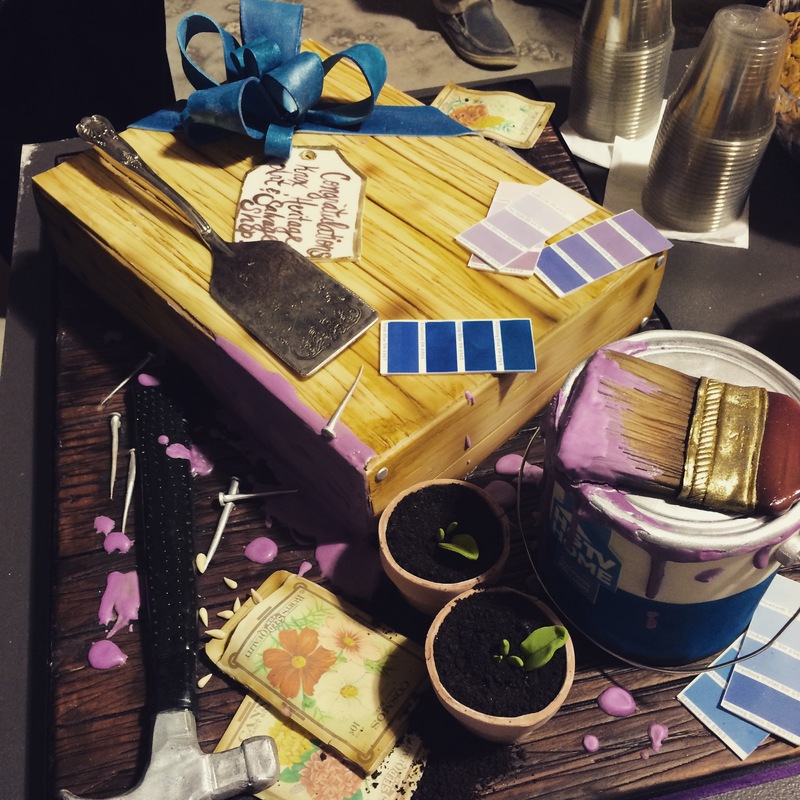 It’s all edible — cake from Magpies with paint can and brush, trowel and dirt, and seed packets and paint chips! 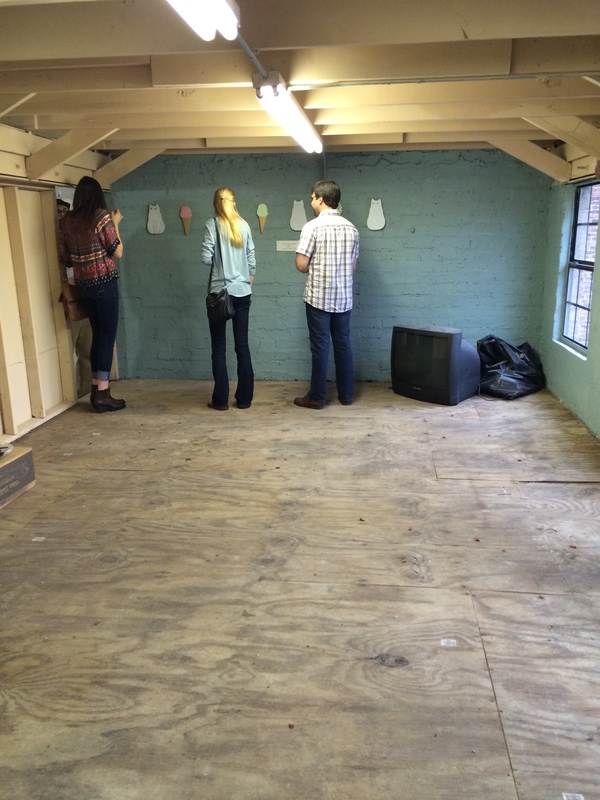 Space for artists’ studios was available for viewing in the back of the shop and upstairs. Lovely space, we might add — some already painted and ready for real work and real sales. Like this one that photographer Michelle Jephcott painted and organized for her matted photos and cards. Her subject matter? Gay Street Bridge, night scenes, Knoxville fireworks, and springtime flowers. 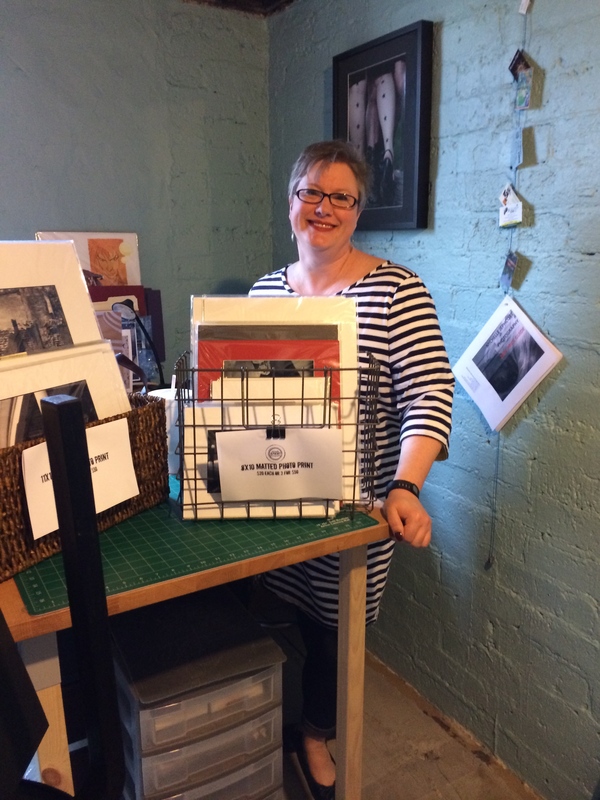 Photographer Michelle Jephcott poses in her newly refurbished artist studio at The Salvage Shop. Some shoppers stopped to admire the flowing tops created from old linens by Brenna Elrod of Evelyn & Elsie. The linens, Brenna told us, mostly belonged to my grandmother. Alix Dempster admires a linen top by Brenna Elrod. Brenna Elrod of Evelyn & Elsie models a jacket and linen top she made from old linens. Other spaces had potential. And were quite inviting — from the size of the room to the paint colors to the urban scenery from the upstairs windows. We like this new place: open with a combination of untouched and finished goods, artists’ studios, and helpful folks everywhere. If you’re out looking at dogwoods (Trails open April 8th. ), you may want to swing by. Who knows? 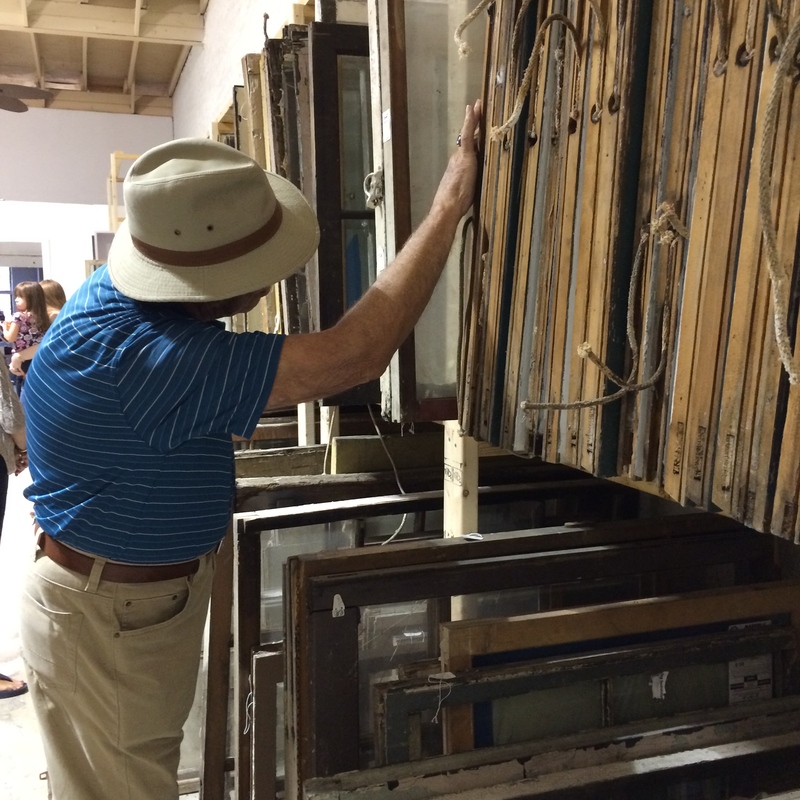 You just may need an old door — and The Art and Salvage Shop has ’em. Along with lots of other great finds. Met at University of Tennessee, been married for 47 years, and still passionate about travel whether we're volunteering with Habitat Global Village, combining work at Discovery with pleasure, or just seeing the world. Hope you'll join us as we try to see it all while we can! This entry was posted in Retail Shops, Tennessee, Travel and tagged Art & Salvage Shop, Brenna Elrod, John Craig, Kim Trent, Knox Heritage, Magpie's, Michelle Jephcott. Bookmark the permalink. Do you have old windows size 20×30? Lisa, I don’t run the Salvage Shop. Do you live in Knoxville? If so, you might try calling them to find out. Thanks for reading! I suspect this place looked so clean because they had just moved into the new space. And you know how spring cleaning goes! Pitch this. Keep that. And label more stuff than when you first began. I love the old, disheveled places because I think I may find more bargains. But this was shop was so nice to rifle through and see the goods better!!! What a great mission of this Salvage Shop! Thank you for the tour, Rusha! Thanks so much. Their mission is a great one, as we have many historic properties in town that the money can benefit. It’s also terrific to see our community come together to preserve history. Thanks, George. I’m glad you are enjoying them. It’s fun going to events such as this one where I feel that the mission and vision are right on target for our community. It’s also fun to support the arts!!! Best wishes to you for a great April!